We recommend checking out our discussion threads on the Belkin QODE Ultimate Pro Keyboard Case for iPad Air F5L176TTBLK, which address similar problems with connecting and setting up Tablet Keyboards Belkin. The user manual for the Belkin QODE Ultimate Pro Keyboard Case for iPad Air F5L176TTBLK provides necessary instructions for the proper use of the product Computers & Solutions - Computer Peripherals - Tablet Keyboards. 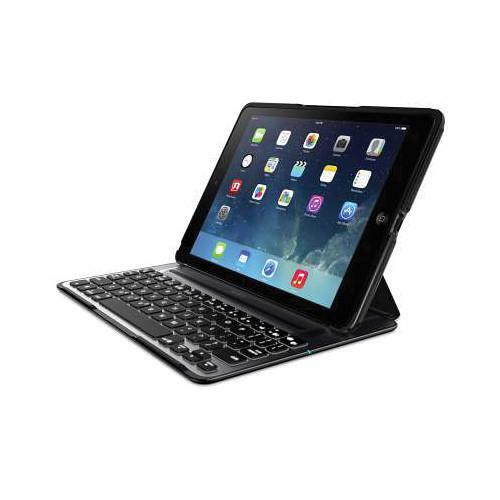 This black QODE Ultimate Pro Keyboard Case from Belkin provides an iPad Air 2 with a physical Bluetooth keyboard suitable for comfortable, long-duration typing. Tablet users accustomed to working on a laptop, as well as those who do not wish to have any part of their iPad's screen taken up by a virtual keyboard can also appreciate this keyboard case's well-spaced and responsive keys. Fast and accurate typing is also promoted by the keyboard design. MacBook and notebook PC users can feel particularly at home with this keyboard case as it contains the same number of keys as a laptop and features three brightness levels which can be set according to various low-light conditions. Built-in magnets secure your tablet into one of two selectable viewing angles so that your iPad's screen is well positioned relative to where you are working while on the go. Both landscape and portrait modes are supported by the keyboard's magnetic hinge that allows for instant repositioning of your tablet's orientation. When you wish to interact directly with your iPad's screen or handhold your tablet, the integrated standalone case that holds the iPad against the keyboard's magnetic hinge can be instantly detached along with a tablet inside. The standalone case is compatible with Apple iPad Smart Covers, so an iPad Air 2 can always be afforded dual-sided protection particularly when being handheld. Whether handheld or connected to the keyboard, the standalone case directs sounds generated by the iPad toward the front of the screen so that audio from the tablet's speakers is improved. When you wish to resume using your iPad on the keyboard, the magnetic elements in the standalone case and the keyboard allow it to be reattached just as quickly. Up to two Bluetooth 4.0 devices can be paired to this keyboard case at the same time, with one-button control provided to select between them. This is particularly useful when typing a document on a tablet and collaborating with a colleague through text messaging. If you cannot or do not wish to hide your document in order to switch to a messaging app on your tablet, but want to continue typing on the physical keyboard and your smartphone is paired as well, you can instantly switch keyboard inputs to the smartphone, create and send a text, then switch back to the tablet. When you are not using your iPad, the keyboard case can be closed over the standalone case. Rubber feet along the case prevent the keyboard from touching the iPad's screen. Anodized, aircraft-grade aluminum alloy is used for durable screen protection. The thin profile of your iPad Air 2 is preserved along with access to all tablet buttons, ports, and cameras. 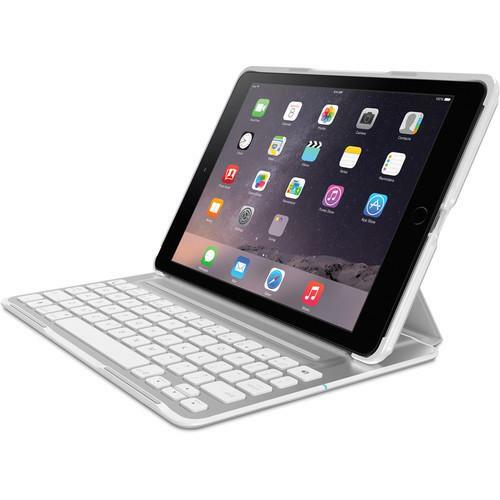 The QODE Ultimate Pro Keyboard Case for iPad Air 2 includes automatic on and off switching by sensing the weight of a tablet that is attached to it. Folding the fabric and magnetic flaps all the way to the rear of the keyboard, also signals the keyboard to turn on. This feature allows for Bluetooth pairing even when a tablet is not resting on the keyboard. These automatic and manual power management features contribute to the keyboard case's battery being able to last for up to one year before it needs to be recharged. The battery is built-in and is not user-replaceable. Box Dimensions (LxWxH) 10.4 x 8.3 x 1.1"
The user manual for the Belkin QODE Ultimate Pro Keyboard Case for iPad Air F5L176TTBLK can be downloaded in .pdf format if it did not come with your new tablet keyboards, although the seller is required to supply one. It is also quite common that customers throw out the user manual with the box, or put the CD away somewhere and then can’t find it. 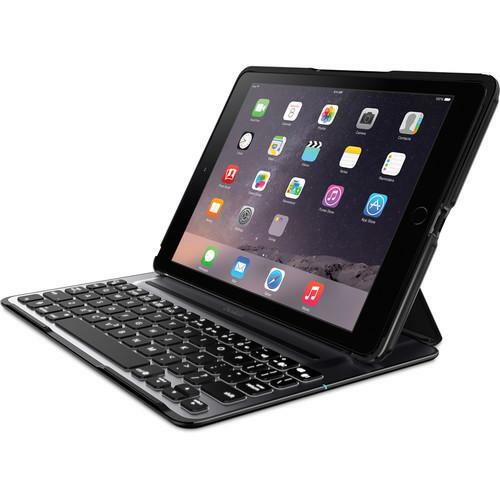 That’s why we and other Belkin users keep a unique electronic library for Belkin tablet keyboardss, where you can use our link to download the user manual for the Belkin QODE Ultimate Pro Keyboard Case for iPad Air F5L176TTBLK. The user manual lists all of the functions of the Belkin QODE Ultimate Pro Keyboard Case for iPad Air F5L176TTBLK, all the basic and advanced features and tells you how to use the tablet keyboards. The manual also provides troubleshooting for common problems. Even greater detail is provided by the service manual, which is not typically shipped with the product, but which can often be downloaded from Belkin service. If you want to help expand our database, you can upload a link to this website to download a user manual or service manual, ideally in .pdf format. 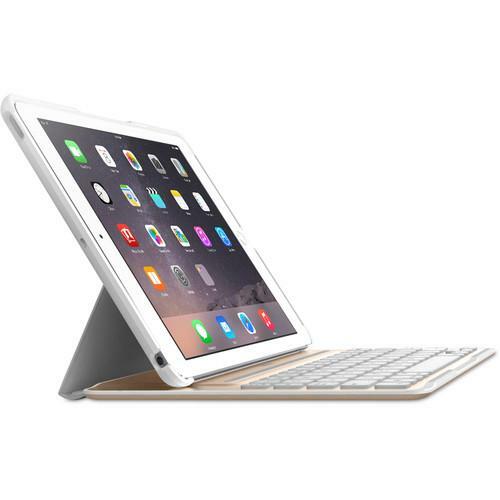 These pages are created by you – users of the Belkin QODE Ultimate Pro Keyboard Case for iPad Air F5L176TTBLK. User manuals are also available on the Belkin website under Computers & Solutions - Computer Peripherals - Tablet Keyboards. Please help & instruct me how I can get & download this user manual! Thank you very much! I am having trouble pairing my iPad Air to the Belkin ultimate keyboard. It has been working fine but now doesn't pair. Blue flashing light but doesn't pair .